The tech-savvy smartphone generation aren’t satisfied with waiting on the sidelines for politicians to take action on climate change. They want results fast, and they want a piece of the action. Adopting a Climatarian diet is a strategy that harnesses consumer power to drive down the production of the food industry’s worst climate culprits. “The Climatarian Challenge app empowers people because they can take the fight into their own hands without relying on policy and politics to catch up,” said Less Meat Less Heat CEO Mark Pershin. Can’t stand the heat? Take something out of the kitchen. What we put on our plates has a much greater effect on the emissions driving climate change than most people are aware of. “The unsung contributor to climate change is the meat industry, which adds as much CO2 as the entire transport industry combined,” said Pershin. Total emissions from the livestock industry account for half of Australia’s greenhouse gas emissions, and a third worldwide once land-clearing is factored in. If worldwide meat consumption continues to increase at current rates, we can expect a 76% increase in agricultural emissions by 2050. This would neutralise the positive impacts of any other mitigation strategies, if and when they’re actually implemented. Reducing per capita meat consumption by 25% could, on the other hand, result in a 51% decline in agricultural emissions over the same period. Such reductions in meat consumption are well within recommended nutritional guidelines. By far the biggest footprint comes from beef and lamb, thanks largely to the land-clearing required for pasture. Reducing red meat consumption would result in savings not only for our overall carbon budget, but also the budget required to tackle climate change. “If the average daily consumption of meat were to be reduced by 22%, the cost of staying within the worldwide target of two degrees warming could be halved,” said Pershin. Saving emissions-intensive red meat for special occasions is one action that can keep us within our carbon budget without sacrificing the things we love. The app allows users to input the portion size and type for any meat included in a meal, and deducts points from the budget accordingly. The higher the carbon footprint of a food item, the more points are deducted. Eating beef and lamb will quickly deplete a user’s budget while chicken is a relatively low-budget option. Meat-free meals keep the budget afloat the longest. To survive the Climatarian Challenge, the user must reach the end of the month with at least a few points remaining in their carbon budget. The app updates users on their progress toward a climate-friendly Climatarian diet, and gauges performance compared with the national average. Users can raise the stakes by competing against friends and family over whose Climatarian strategy is most successful. Less Meat Less Heat are on hand throughout the month with tips, hints and recipes to keep users from blowing their budget. And for those irresistible splurges, the app includes listings of nearby restaurants offering special deals on Climatarian options to those taking the challenge. With responsibility for a safe climate future on our plates, we can use our knives and forks to cut out a large portion of risk. 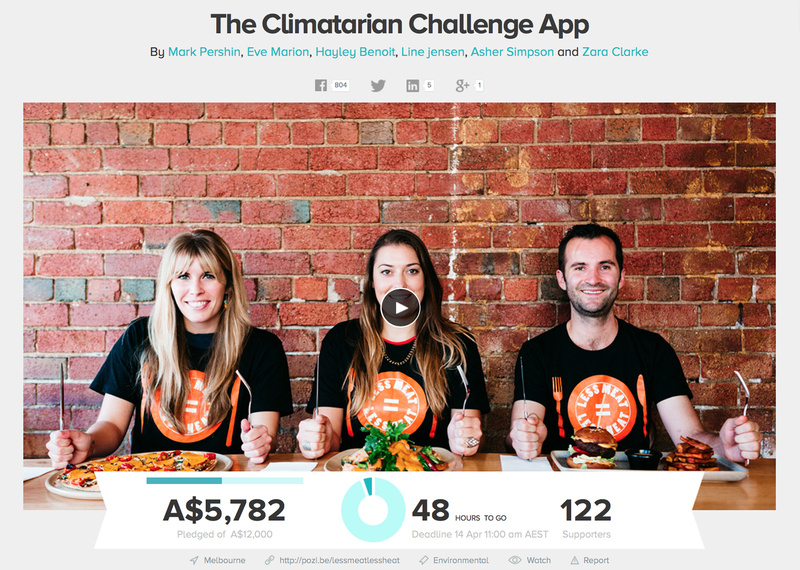 Less Meat Less Heat’s crowdfunding campaign for the Climatarian Challenge app ends at 11am (Australian eastern standard time) on Thursday 14th April, so get in quick if you want to show your support! 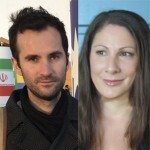 This entry was posted in Activism, Animals, Climate change, Food and tagged activism, climate change, food, sustainability, world health by Mark Pershin & Kari McGregor. Bookmark the permalink. Mark Pershin originally came from the dark side, completing a Bachelor of Business majoring in marketing at Monash Uni and has since completed a Graduate Diploma of Environment at Melbourne Uni. His interest in addressing climate change started with some volunteering at Beyond Zero Emissions and culminated in coordinating divestment campaigns and city groups for 350.org in Melbourne and Amsterdam. Mark’s professional skills and experience lie in digital media and analytics. Mark founded Less Meat Less Heat in March, 2015. Mark is based in Fitzroy, loves all aspects of music, does not wear skinny jeans and follows a climatarian diet. A free-spirited downshifter, Kari McGregor is a freelance journalist and editor of SHIFT magazine, a volunteer collective of passionate sustainability activists and advocates. Harbouring nomadic tendencies, she has sampled life in the UK, Spain and Thailand before settling in Australia and making tropical Far North Queensland her home. A former teacher, Kari now whiles away her days studying full-time, working as little as possible for dollars, and contributing whatever energy she has left over to the economic degrowth movement. She blogs at www.deepershadeofgreen.net, freelancing a critical spin on our planetary predicament.